Crowley Maritime for up to 14 new vessels, and the publicly- traded stock is up over 2200% in the past 18 months. On the topic of excellent public stock performance, it is hard to miss the outstanding run at Kirby Corporation (NYSE:KEX). In previous articles, we have followed the dra- matic growth of Kirby both organically and via acquisition. The company made six acquisitions since 2008 with a total value of over $800 million, and it seems that their strategy and integration efforts have proven successful. Figure 1 displays the outsize performance of KEX stock, especially when com- pared with the lagging offshore service and offshore drilling indices over the past three years. Wyden of Oregon. 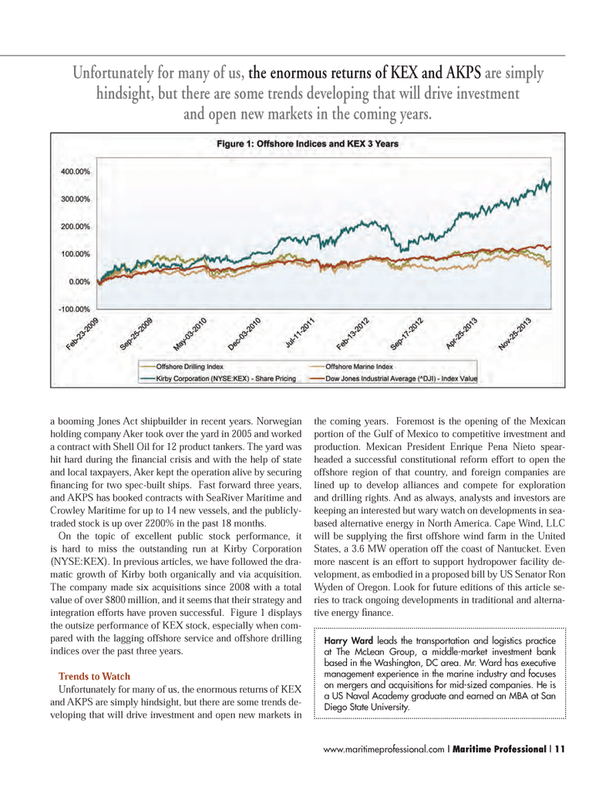 Look for future editions of this article se- ries to track ongoing developments in traditional and alterna- tive energy fi nance. Unfortunately for many of us, the enormous returns of KEX and AKPS are simply hindsight, but there are some trends developing that will drive investment and open new markets in the coming years.